This exhibit tells the story of the architects and artists who came to Norwich in the decades following World War II, building in the latest modern styles and materials and in the process changing the landscape of Norwich. Research for the exhibit was conducted in conjunction with the Norwich Historic Preservation Commission’s National Register District nomination and Lyssa Papazian. Walter Curt Behrendt (1884 – 1945) first worked in Germany shaping public housing policy and later moved to Norwich, VT, and became a visiting lecturer at Dartmouth. 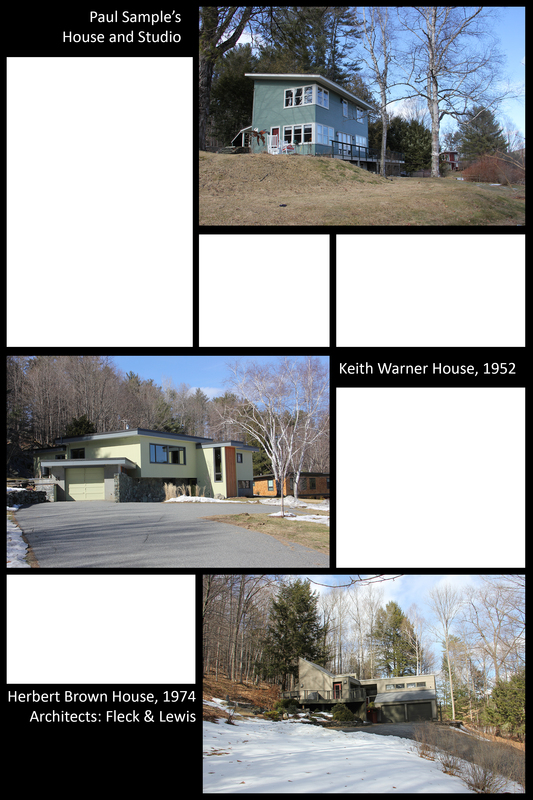 Edgar Hayes Hunter (1914-1995) and Margaret King Hunter (1919-1997) were the leading proponents of the purer Mid-Century Modern style locally, teaching at Dartmouth and practicing in Hanover for 20 years. Both were students of Walter Gropius at the Harvard Graduate School of Design. Allan J. Gelbin (1929-1994) was a well-known architect who spread the concepts of Frank Lloyd Wright and his own interpretations in the northeast. This exhibit is in conjunction with the Norwich Historic Preservation District’s nomination of the Hopson Road neighborhood as a National Register District. Initial research for the exhibit was conducted by Lyssa Papazian. Friday, June 16, 5—7 p.m.
Tickets: $20 to fund Hanover High School scholarship fund. Rain date, Sunday, October 22. Ray School parking lot. Roy Banwell, noted Hanover architect, will guide the tour. Address to send the check: Hanover Historical Society, P.O. Box 142, Hanover, NH 03755. Provide an email address for communication. Open after Thanksgiving through December. Open House on Saturday, December 2nd from 11:00 a.m. – 2:00 p.m.